Professor Roberts graduated from Manchester with a degree in Medicine and a BSc in Anatomy. She undertook her early medical training in Manchester and her research in Manchester and the Karolinska Institute in Sweden. In 1995 she was appointed Senior Lecturer in Transplant Immunology at the University of Manchester. In 2000 she was appointed Professor of Medical Education at the University of Leeds. She was awarded a National Teaching Fellowship in 2006. In 2009 she was appointed Director of the Leeds Institute of Medical Education. She was a council member of the General Medical Council from 2009 until 2012 and Chair of the Association for the Study of Medical Education until July 2013. She was a council member for the Royal College of Physicians of London from 2010 until 2013 and is currently a Censor for the College. 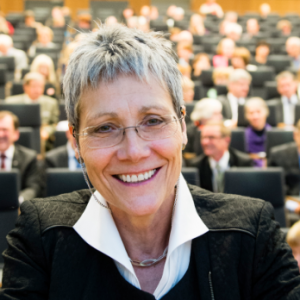 In September 2013 she became President of the Association for Medical Education in Europe. Professor Roberts’s main interests and expertise are in the areas of assessment of competence, professionalism, and transitions in training and education.